June may be one of our shorter months but it hasn't felt like it. It's been a glorious month weather-wise here and it has actually felt like summer. I've written less blog posts this month than ever but I feel I've lived the life I write about more than ever, too. Having a smart phone and instagramming (is that a verb) has certainly helped me capture these happy moments without it being time consuming. And not having a permanent job right now has made my summer a lot less stressy too. 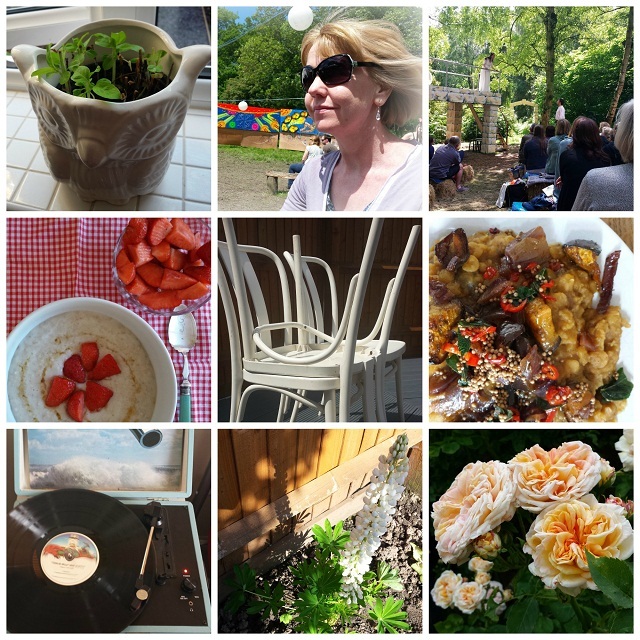 Whilst I haven't updated my simple pleasures list on my sidebar recently it's something I like to reflect on from time to time. Taking photos on my phone and using Instagram is a great way to create a visual gratitude diary. All of these photos are from my phone and hold sweet memories. ♥ Opening windows first thing. I enjoy snatching a little bit of extra time on bright mornings and find it hard to stay in bed. ♥ Lunar festival. We had a fun, chilled time. ♥ Shakespeare in the Park (the balcony scene in Romeo and Juliet). We were lucky to get free tickets through our local arts organisation. A perfect way to spend a summer afternoon. ♥ Decluttering at a car boot sale and bagging these bargain chairs from Ikea at the same time (£5 for three). ♥ Augergine dhal, a new recipe. I've made it twice this month. ♥ Having our student son home and his rather cool vinyl collection. ♥ Nurturing white lupins in my new garden. ♥ National Trust visits. We returned to Packwood House in Warwickshire. I loved the sorbet colour of these roses. What are your current daily pleasures? I'd love to hear. July beckons and we've got a busy month with a 70th birthday party, our local festival (with hubs and band performing after a long break), an anniversary date night, a garden to finish for my dad's birthday celebration and tomorrow I'm off for a day adventuring in London. Excited, happy and busy. Sounds like very enjoying June was had and that July offers just as much. lovely photos ,have a great July ,could we see your minimalist wardrobe! A perfect month, I think. Culture, food and flowers - in that order, for me! And the poster safely back with me in Switzerlan LOL! !